Notice - the March 2 session has been SNOWED OUT - stay home and tie by the fire! the largest group since we started meeting. I think our flies are starting to look a little better and we always have a good time. The meeting this month should be really helpful because Scott Abernathy plans to be there. Scott ties a lot of flies for Unicoi and has been a commercial tyer for quite a while. If you've never seen him tie, you need to be there. He ties great looking flies that catch fish and he ties them real fast--don't blink. He says he will show us some of his methods for tying and this will really help you in creating better looking flies. Scott not only does a great job when it comes to tying flies, he's also a pretty good guy--he's helped me on many occasions in the past. 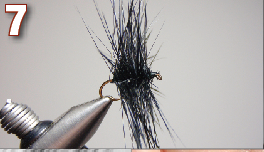 We'll also be tying the "skater spider"--the fly in the picture. I don't think we can mess this one up. Robert Sullivan, who's really getting into tying, will show us how to tie this dry fly. Robert, Sid Snow, and Joel Hope did a great job helping customers with fly tying last Sat. and Sun. at Bass Pro. We had a booth set up there representing the Foothills Chapter of Trout Unlimited. So, I'm really looking forward to the meeting Tues.--hope you are. Bring a vise and tools if you have them, but more important, bring a friend. This session is for beginners as well as experienced tyers. Learn how to tie better and teach us how to be better tyers. It's a good feeling to catch fish on your flies.